CAPE CANAVERAL, Fla. — Though temperatures within the Spacehab laboratory inside space shuttle Columbia's cargo bay are running a little higher than normal, NASA missions managers say around-the-clock research is continuing in orbit. The trouble is with a Spacehab internal system that separates condensed water and air, and because the problem is related to how the research double module is kept cool, temperatures inside the laboratory have climbed a bit. "Even though the air temperatures are a little bit warmer in the Hab right now than they would normally be, it's really not a factor for the crew," NASA mission operations manager Phil Engelauf said Tuesday. "It's really not even outside their comfort level." Normally the air temperature is kept close to about 72 degrees Fahrenheit (22.2 degrees Centigrade). But as flight controllers wrestled with the trouble, conditions inside Spacehab peaked at 84 degrees Fahrenheit (28.9 degrees Centigrade) and by Tuesday afternoon had fallen to 76 degrees Fahrenheit (24.4 degrees Centigrade). Mission managers are considering repair options, but Engelauf said it likely will be easier to deal with the problem by adjusting the way air and water flows through the plumbing of Columbia's crew cabin, the Spacehab module and the tunnel that connects the two. So other than that one issue, Engelauf said he was "happy to report the orbiter and the crew are all doing very, very well." Working in two shifts for 24-hour operations, Engelauf said the seven-member crew has "a pretty high level of activity, and they're pressing through their scheduled experiments and operations pretty much right on schedule." More than a dozen experiments are being touched by the crew on each shift, with many of those requiring daily donations of blood, urine and saliva samples by most, if not all of the crew. The samples are supporting a variety of life sciences experiments designed to study how the human body reacts to the weightless space environment. Another activity the astronauts are doing to support the medical studies is to use a bar code reader to record the food they eat, and the amount and type of exercising they do. Among the major investigations given attention by NASA on Tuesday was the Vapor Compression Distillation (VCD) flight experiment, a technology demonstration effort designed to test equipment that can be used to purify urine and turn it into drinking water. After three days of operations, principal investigator Cindy Hutchens said she was pleased. "So far it looks like what we expected," Hutchens said. The compact system takes urine — which is simulated on this flight — evaporates it, separates and collects the solids from the resulting vapor and then in a separate place condenses the vapor back into water again, where it can be further treated to become potable. Testing this hardware on the shuttle is to lead to installation of the system on the International Space Station during 2006, Hutchens said. "We feel like this is going to be a great improvement to the space station because the crew and the shuttle will not have to take up so much water," Hutchens said. When installed on the space station, the technology is expected to process about 4,400 pounds (2,000 kilograms) of water each year. One run of the system was postponed because of the problem on Spacehab, but officials said that by the end of the planned 16-day mission all of the planned VCD experiment runs would take place. During Tuesday's day shift of the Red Team — which includes commander Rick Husband, mission specialists Kalpana Chawla and Laurel Clark, and Israeli astronaut Ilan Ramon — the crew received a VIP phone call from Israel's prime minister, Ariel Sharon. Speaking mostly in Hebrew, Ramon told the prime minister the view of Earth was beautiful and noted how fragile the planet's atmosphere seems from orbit. 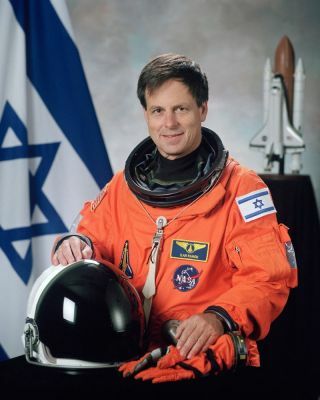 The Israeli astronaut also showed Sharon a small scroll filled with scripture from the Torah that was given to him by a professor who had survived a Nazi concentration camp. By carrying it into space, Ramon hoped the act would symbolize his desire for a peaceful future. "This represents, more than anything, the ability of the Jewish people to survive despite everything from horrible periods, black days, to reach periods of hope and belief in the future," Ramon said. Sharon invited Ramon and the crew to visit him in Jerusalem after the flight and told Columbia's commander they would be among friends. "We really appreciate the invitation, and if the people of Israel are as nice as Ilan and his family, we know that we will be expecting a very warm welcome when we come to visit Israel," Husband replied. Columbia's mission is to continue until Feb. 1.